Once it became clear that Hurricane Irene was a major story in Vermont — and a nonstory almost everywhere else — the national news media poured in. Correspondents from CNN, CBS News, the New York Times, Reuters, Bloomberg and Time magazine flocked to the small towns devastated by the storm’s raging floodwaters. Within 24 hours, Vermont was in the national mainstream media spotlight. Even before the storm had passed, some locals began grumbling about how the national channels were covering the story — or not covering it. Gov. 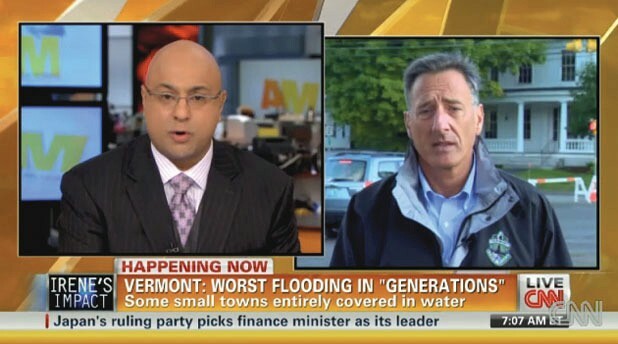 Peter Shumlin himself took a swing at the “national press” two days after the storm, when he disputed reports of people being “stranded” in towns without access to medical care. In fact, some Vermonters couldn’t get medical care in the hours following the floods. In Grafton, population 2000, road washouts left one dialysis patient and another in need of chemotherapy with no way out until midday Monday, August 30, according to Windham County Sheriff Keith Clark. Several days later, Sheriff Clark told Seven Days that his information was accurate at the time. Later that day, the patients were evacuated on an unimproved, “class 4” road. If the national media can be faulted for anything, it’s being “too New York-centric” and being 24 hours late to the story, says David Mindich, chair of the Journalism and Mass Communication Department at St. Michael’s College. What the national media got was a portrait of Vermont that reinforced the folksy, quaint image that many outsiders already have. Newscasts across the country picked up Susan Hammond’s home video of the Lower Bartonsville covered bridge being swept away. A widely circulated Associated Press story profiled the isolated town of Rochester, where citizens came together for daily town meetings to share news and concerns. In a story headlined “Flooded Vermont Town Epitome of Patience,” CNN noted that Pittsfield, population 427, dealt with the deluge by throwing a town barbecue to feed the masses. Other tales were less stereotypically Vermont: Bloomberg reported on a marooned Wall Street trader who hired a helicopter to pick him up in Pittsfield and fly him home to New Jersey. More important than how accurately the state was portrayed, Mindich says, is that it got sufficient attention. National media exposure facilitates federal disaster assistance. That’s why Shumlin spent the first few days doing interviews with Wolf Blitzer, Amy Goodman and anyone else who extended an invitation, Mindich says. How quickly? Ordinarily, Clifton says the story would be bumped after just a few days or weeks. But he says there’s one thing that could give this one a longer shelf life.